2018 JET SKI® ULTRA® 310 SERIES "GRAB FUN BY THE BARS"
Chaparral Boats: Click here to view the lineup. Crowe Marine is a third generation marine dealership. We are located on beautiful Lake Oconee and serve the whole Lake Oconee, Lake Sinclair, and Jackson Lake area. We sell Bennington pontoon boats, Chaparral boats, Hurricane deck boats, and Kawasaki Jet Skis. 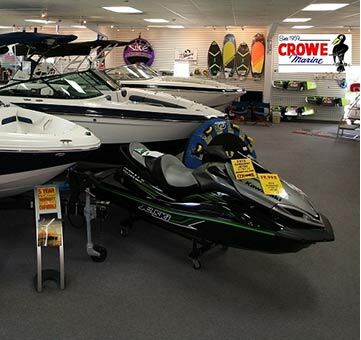 Our Parts Department has everything you could need for your boat, Yamaha outboard, MerCruiser sterndrive, Rotax jet engine, or personal watercraft! In addition, we have a fully stocked accessories and watersports department, with all of your life jacket, waterskiing, wakeboarding, tubing, and stand up paddleboard (SUP) needs. We are your one-stop shop for everything you need to have fun on the lake! With several at-your-dock service trucks and an impeccably clean four-bay Service Department staffed by factory certified technicians, we promise to serve our customers promptly. In addition to emergency tow service, we are fully staffed and certified for repair and routine maintenance on all Yamaha outboard, MerCruiser and Volvo sterndrives, and Rotax jet engines. Have a service question? Call us anytime! Our mission is to be your marine dealership of choice. We believe that long-term commitment is about more than just selling a great product. Crowe Marine strives to sell the best quality marine products available and to do so in an environment you can trust. We offer superior service by friendly, courteous employees and guarantee 100% customer satisfaction. Our promise is to put the needs of you, our customer, first.